As a coffee shop owner, you pour your heart and soul into building a business that serves a great product and delivers that “certain something” the big coffee chains just can’t capture. 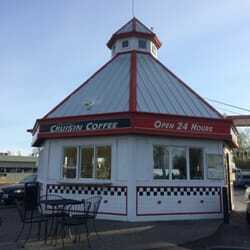 More than 20 years ago Ron Clark had an idea that would later grow into Washington state’s favorite drive-thru beverage experience, Cruisin Coffee. The idea was to “build a first-rate espresso stand, offer the best tasting espresso drinks, carry the best quality products, and keep it open 24 hours a day”. This idea took hold in Bellingham, Washington, and has turned into a growing business that continues to please thousands of customers everyday with its 13 locations across the state. When your business grows and you’re managing multiple locations, the right tools are essential to keep the operation running smoothly. “Cruisin Coffee is known for its consistent customer service and the quality of the product. We strive to make sure each customer gets exactly what they want as quickly as possible” says Ed Mack. Cruisin Coffee isn’t your typical coffee shop, with each location boasting two drive-thru lanes and a walk up window. “When there’s a line, we make sure to go outside and take orders so that their drink is ready when the customer gets to the window to pay”. To help stay on top of their thriving multi-location operation, Cruisin Coffee has depended on Coffee Shop Manager since 2003. In those 12 years, they have incorporated technology tools like enterprise reporting and loyalty marketing to maximize their Point of Sale ROI. One key factor to success is having a solution that knows coffee, and is specialized for the coffee industry specifically. “I like the fact that it’s reliable and consistent. It’s easy for staff to build the drinks, to find the product, they really customized it to our needs” continues Mack; “I also appreciate that I can get sales information from any location at any time of the day”. Crusin Coffee has been able to manage so many locations seamlessly with the help of Coffee Shop Manager. “The consistency of the product has made running our operation so much easier. We can train at the office then send the employee to any location because it’s the same system. It’s so much easier to pick up shifts between different locations, it’s really seamless”. There are many benefits to choosing a specialized coffee Point of Sale option over a generic solution or cash drawer. Mack says “we used to have a cash register programmed...it required much more intense training and we had many more mistakes. Now we have something that’s way more efficient, we have support...someone to call that knows the industry. They understand the customer’s needs versus talking to someone that has no idea what we need”. Managing multiple locations no doubt has its challenges, but implementing the right technology solutions can ease the workload significantly. “The right technology simplifies the operation...from being able to process credit cards online through CSM, create gift cards and customer cards, track free drinks and purchases, see customer history and add a free drink when we need to go that extra mile”. This is one coffee shop that has mastered the art of keeping customers coming back again and again. Besides having a great product and great service, Cruisin Coffee has utilized Coffee Shop Manager’s automated loyalty marketing to hone in on their customers. “We have the ability to have a customer call in and we can get their loyalty card number which gives us an exact time, date, and location that they visited. We can easily manage customer complaints, and we reward loyal customers with a free drink of their choice every 12th visit.” The numbers don’t lie - “We have between $55,000 - $65,000 on Cruisin Cards at any given point, customers trust us with their money”. As a coffee shop owner you have a lot of choices, but no other system is designed from the ground up by coffee industry veterans. When purchasing their system in 2003, Ed says that the CSM owner’s “passion and willingness to demonstrate the product and reassure us that there is support we can depend on made us very comfortable”. So what advice do the pros at Cruisin Coffee have if you’re looking to buy a system? “I would encourage someone to trust CSM and depending on how many stores they have, get the HQ reporting. Especially if they have multiple locations, investing in the back end of the software helps you stay more on top of your business”. To get the most out of your Point of Sale investment, Ed recommends investing in training and embracing a preferred credit card vendor for additional security and support. “At the end of the day a customer just wants a drink, if we can minimize other issues with the till business can run much more efficiently. Between CSM, credit card processing and loyalty, it’s seamless...and if I do have an issue, I can call and get support. As for Cruisin Coffee’s relationship with Coffee Shop Manager, Ed says he sees CSM not as a business associate, but rather on some level there’s a friendship. “Eric, Kim, Charlie and Kristina truly want to help, and I believe that makes everything so much easier”.